SAN ANTONIO, June 17, 2013 — San Antonio-based Admiral Capital Real Estate Group today announced a joint venture with northern California-based South Bay Development Company to recapitalize and renovate 4500 Great America Parkway, an approximately 75,000 square foot office building prominently located in Santa Clara, California. 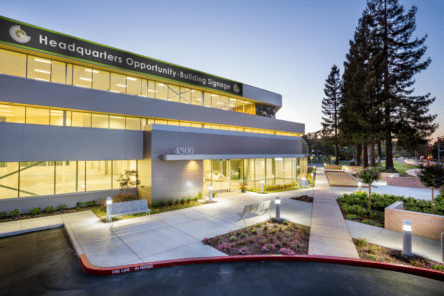 The investment will afford Admiral an opportunity to recapitalize a well-located building in the reinvigorated Silicon Valley office market and add value through renovation and re-leasing. Developed in 1983, 4500 Great America Parkway occupies 3.72 acres at the intersection of Great America Parkway and Patrick Henry Drive, inside the Golden Triangle of Highways 101, 237 and 880. Its location is two blocks from the Valley Transit Authority Light Rail station and the $1.2 billion, 68,500-seat Levi’s Stadium, future home of the San Francisco 49ers upon its completion in 2014. The joint venture plans to upgrade this three-story building, to Class A standards through significant lobby, storefront, landscaping, and interior improvements as well as HVAC and electrical enhancements. “South Bay is very excited about our new partnership with Admiral Capital Group and USAA Real Estate Company. We are looking forward to working with our new financial partner and successfully completing the building renovation and releasing of the project,” said South Bay president, Jim Mair. “South Bay Development Company together with President Jim Mair has been a significant developer and manager in Silicon Valley for more than 30 years and we value the opportunity to partner with them,” Robinson added. 4500 Great America Parkway is Admiral Capital Group’s first investment in the desirable Silicon Valley office market. In addition to 4500 Great America Parkway, Admiral has more than $150 million in assets under management across the U.S. including value-add holdings in office buildings, multi-family projects, two hotel properties and a performing mortgage on a non-gaming hotel in Las Vegas. Admiral Capital Group was founded by NBA Hall of Famer, philanthropist and U.S. Naval Academy graduate David Robinson and managing partner Dan Bassichis. Admiral Capital Group was founded by David Robinson, philanthropist and NBA Hall of Famer, and Daniel Bassichis, formerly of Goldman Sachs. Admiral, in partnership with USAA Real Estate Company acquires value-add real estate opportunities through equity and debt investments in office, hotel, multi-family and retail properties valued between $15 million and $50 million. The Admiral founders have also pledged 10% of their profits to philanthropic causes in areas where the fund invests, building on Robinson’s lifetime commitment to support education and lower income communities. For more information, visit www.admiralcg.com.